Dolls with arms and legs and all kinds of decorations!
. . . CLICK here for many more Photos !
. 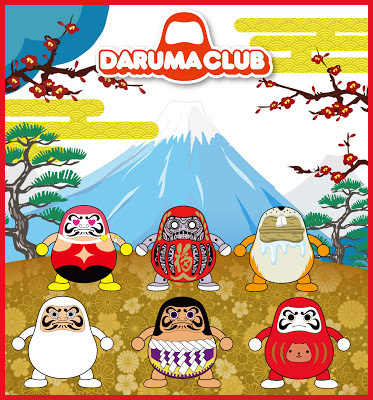 Daruma Otoshi だるま落とし　だるまおとし . 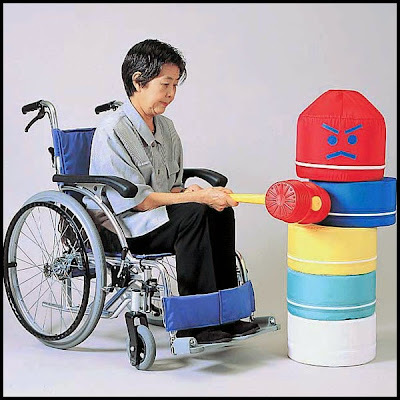 The game is played by using a small hammer, and you must hit each of the colored pieces, from bottom to the top, without letting the pieces fall during the game. This is a park-like area, where 33 Zen-temples are located in the town of Hirosaki. They are supposed to protect the castle of Hirosaki, which is famous for its late cherry blossoms. This historic area, the former "Nakamachi", was the living quaters of the samurai of the Tsugaru clan. There are still many traditional buildings left. You can enter through the Black Gate, Kuromon　黒門 or the Red Gate, Akamon 赤門. Walk along uwatera doori 上寺通り（うわでら）or shitadera doori 下寺(したでら）通り. 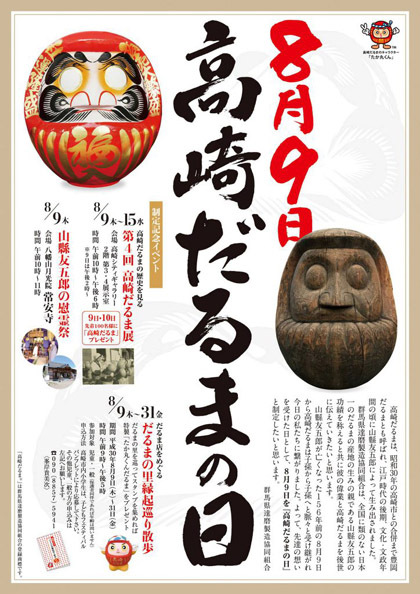 The historic site of historic site of temple Choshoji (Chooshoo-ji) 長勝寺 is included. This temple was the official temple of the Tsugaru domain. 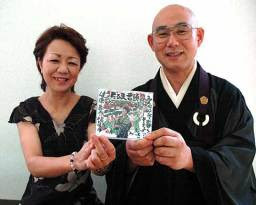 Ondo, a song to dance along in traditional Japanese fashion. This song and dance was performed in Sapporo during the Fire Festival. 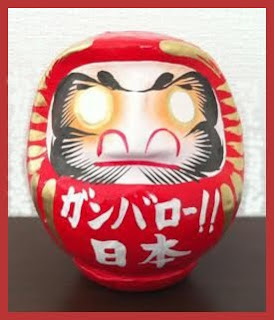 Installed into the eye of a Takasaki Daruma Doll ! The lens is about 1 mm only. 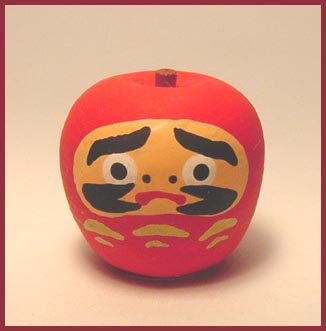 and Jomo Karuta, see below. 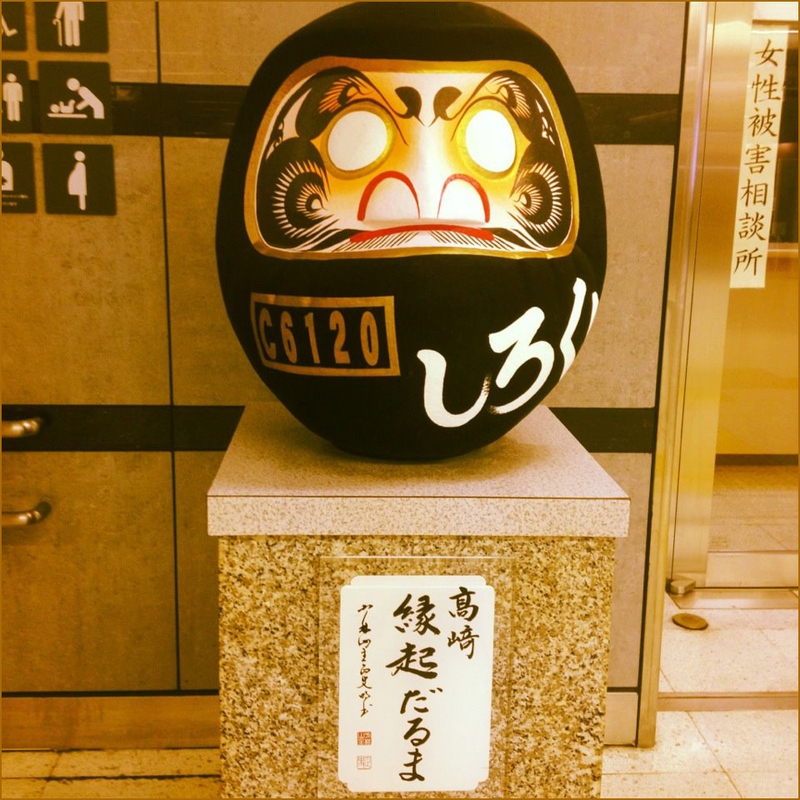 The temple where the Daruma Dolls originate! 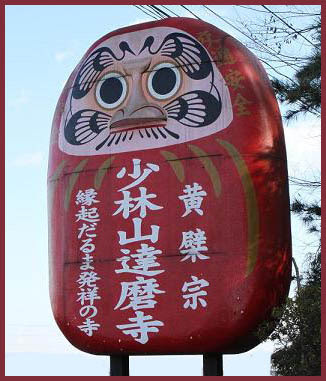 The town of Takasaki, famous for the Shorinji-Temple and many Daruma goods, has choosen its new town mascot, Taka Maru Daruma. He wears a blue headband and has lively eyebrows. 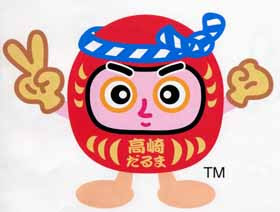 His hands take the pose of the "Scissors, Stone and Paper", a popular game in Japan. It took our ancestors many ages to establish a nation of kindred race and language, to endeavor to be a morality-loving people, to declare this sun-rising country Japan, and to fly the national flag. In World War II in which Japan fell victim to the atomic bomb for the first time in the world, burned-out cities were in ruins, war victims and unemployed people overflowed into the streets, many war orphans survived. 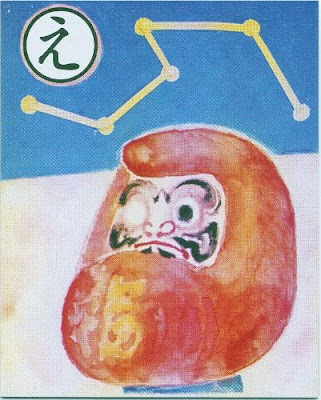 The Gunma Relief Association, the predecessor of the present Gunma Cultural Association, was active in supporting war victims, fighting its way in bitter life, with local love and national pride, under the flag of two white pegeons face to face on the background of the green earth.The homegrown "Jomo Karuta cards" was published with two sets of 44 reading and picture cards and accompanying explanations of the Karuta cards, under the slogan "Let the wise provide wisdom, the able ability, and the rich riches", by the cooperation of many people who answered the appeal for contribution.The Jomo Karuta was produced in accordance with the enactment of the Juvenile Welfare Law, and was recommended as a cultural asset under the Law. Children in those days learned from the reading and picture cards in their little case the existence of noted places, historical spots and heroes unknwn to them, and must have yearned for them. 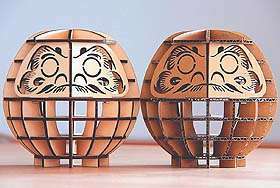 The card game of old Japanese tradition was used as a substitute for textbooks on history, geography and moral education because they were temporarily curtailed by the Allied occupation forces after the war. 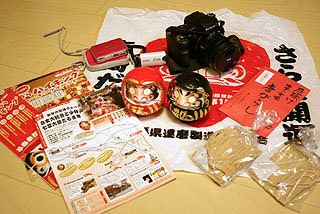 Gunma's First Jomo Karuta Game Championship started two months after the publication of the cards. Click for more KARUTA ! 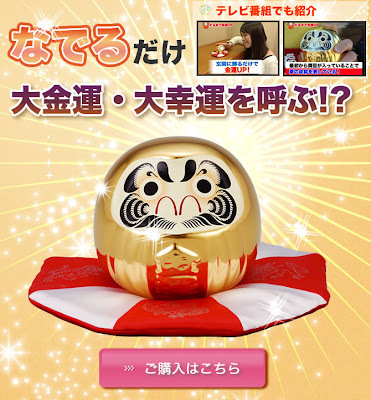 組み立て式だるま build your own Jomo Daruma ! 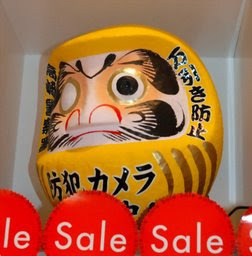 Daruko, also Naruko だる子又は鳴子 from Takasaki. 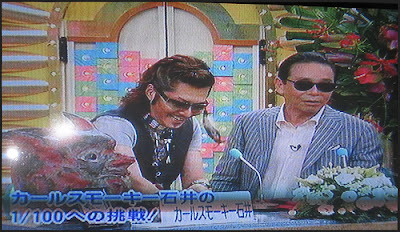 Photo by Saori Shiraishi, on FB. At the station all the shops were closed, even the bento lunchbox shop. 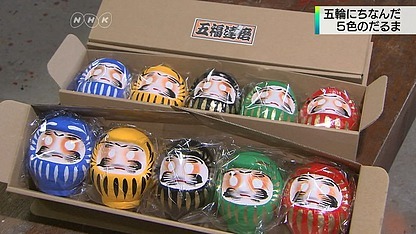 Lovers of Japan's traditional red daruma dolls can now buy them in the 5 colors of the Olympic rings. 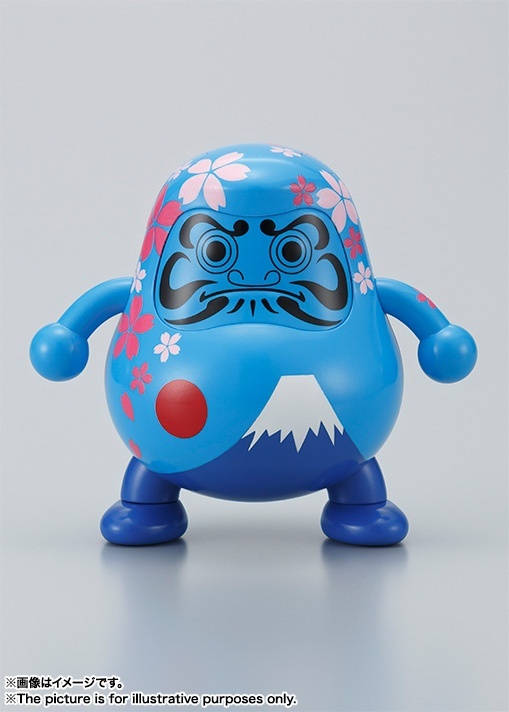 One Takasaki-based maker has produced the set to commemorate Tokyo's successful bid to host the 2020 Olympic and Paralympic Games. 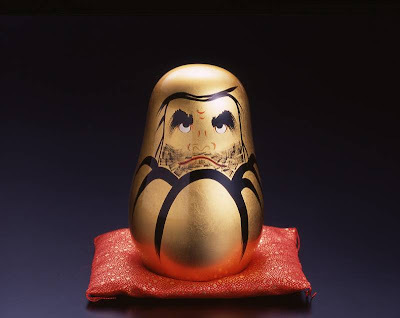 Takasaki is the city where most daruma dolls are manufactured. And the firm has been producing them in unconventional colors for the past 15 years. 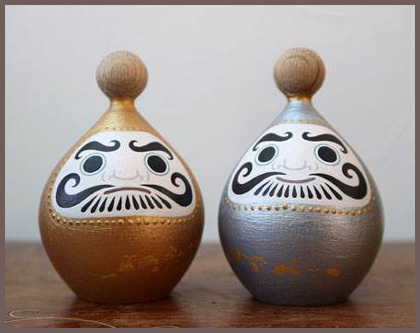 Six craftsmen were busy on Thursday drawing the signature mustache on the dolls and boxing them for shipment. CEO Sumikazu Nakata said he hopes the product can help enhance expectations for the Olympics.
. 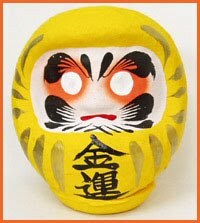 Folk Toys from Gunma . 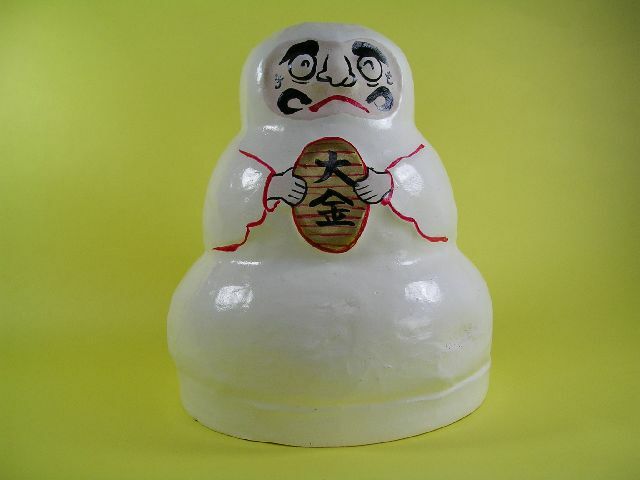 The singer and artist Ishii Tatsuya has tried his hand at five Daruma objects. With a great PHOTO ! © COPYRIGHT MORI BUILDING CO.,LTD. seated on the back of St. Mark the Evangelist (the founder of Ethiopian Coptic Christianity). 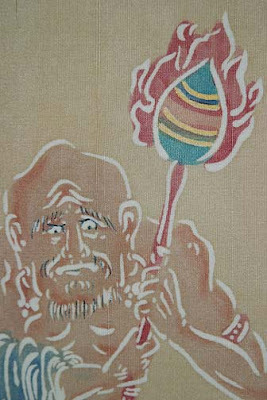 St. Daruma holds a staff with a houju finial. 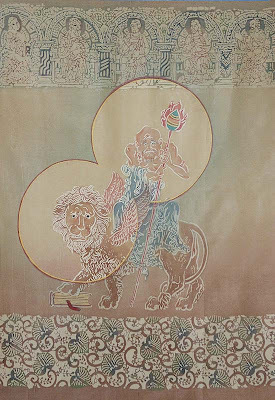 The border at top is of the Four Evangelists, representing Christianity, and the border at the bottom is the aoi leaf, representing Buddhism. 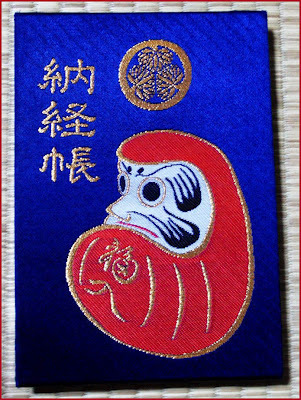 St. Mark seeks comfort from the bible, while St. Daruma clutches the houju.
. Christian Celebrations in Japanese Kigo . 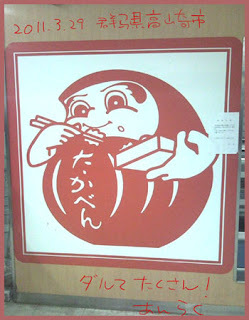 This is a pun about the word mochi, rice cake and holding something, motsu. Here we have Daruma in the form of a rice cake decoration, holding a piece of money, thus implying he is rich. 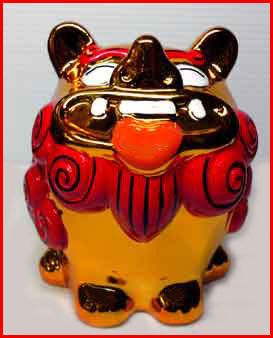 Made of 18 karat GOLD ! 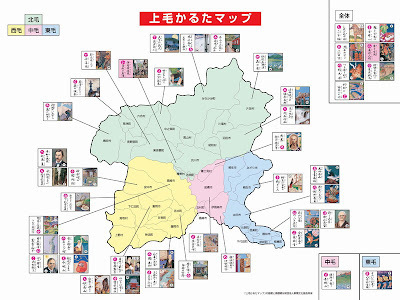 Ishikawa prefecture 石川県 produces almost 100% of the gold foil used in Japan. 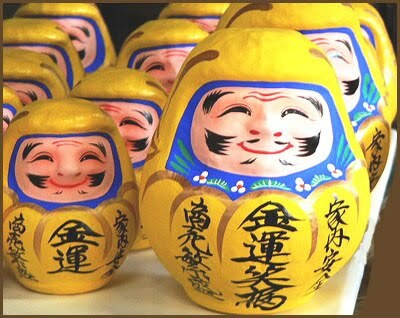 It is also used in Kyoto, for example for repairs of the Golden Pavillion Kinkaku-Ji 金閣寺. There is also a bread with gold foil chips on it ! 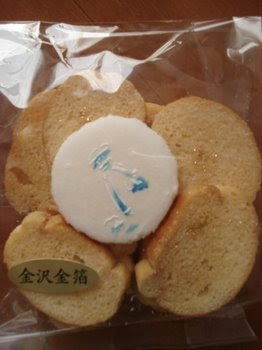 The white rice senbei has the pattern of a famous stone lantern in the park Kenroku-En 兼六園. This pamphlet floated in my mailbox on January 6, 2011. 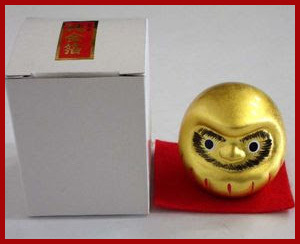 You only have to put this golden Daruma in the entrance hall and strike him carefully when you leave the home ... then he will help you to get rich and avoid all misfortune. 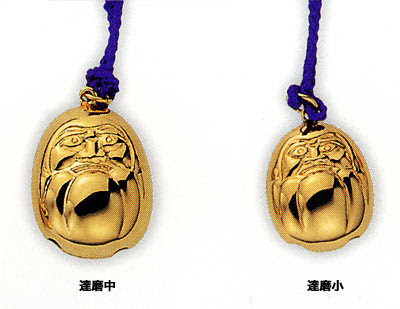 Gold is seen as round, so this Daruma is almost round.
. Shoobai Hanjoo 商売繁盛 good business . 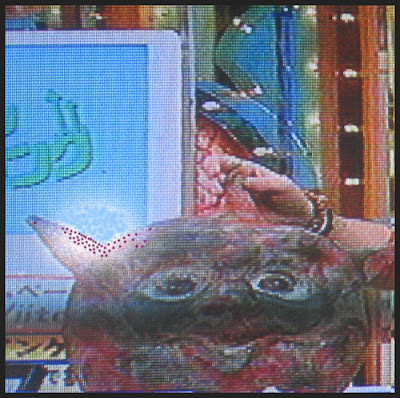 amulets and talismans to make more money !